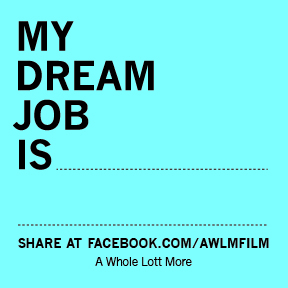 "My Dream Job Is" a fun sticker campaign that we have put together as part of the release of the documentary film "A Whole Lott More". The campaign allows people of all abilities to communicate their ideal employment scenario in a fun way online. All you have to do is fill out the colorful stickers with what your dream job would be - from Astronaut to Janitor to Zamboni driver - whatever job would suit you best! Then post a picture of the sticker - or ideally of yourself wearing the sticker online. Please upload the stickers to www.facebook.com/AWLM. You can also use the #mydreamjobis both on Facebook and Twitter. And if you haven't already please check us out on social media on Facebook or on Twitter.